Back then, Hurston was studying anthropology at Columbia University and doing fieldwork, collecting black folklore and historical data. Cudjo Lewis was already known to those who cared about black history. He was the last known living person who could recount first-hand the experience of having been taken captive in Africa and transported on a slave ship to the United States. Cudjo spent years in slavery and after the Civil War helped found a settlement called Africatown near Mobile. That's where Hurston interviewed him over a three-month period, coaxing Cudjo into talking about the past with gifts of peaches, ham and watermelon. The short book-length manuscript Hurston produced in 1931 was called Barracoon, named after those structures — like holding pens or stockades — where captured Africans were confined before being loaded onto ships. Hurston's manuscript has a complicated backstory, but the gist is that the book generated little interest back then from publishers. Only Viking Press was willing to publish it with the stipulation that Hurston change Cudjo's voice, transforming his dialect speech into the King's English. Hurston refused and Barracoon languished, known only to scholars until now. For skeptics who believe that all the archives have long been plundered and all the literary treasures of the past have already been published, Barracoon will be a conversion experience. It's a monumental work, not "merely" because it describes aspects of the slave trade that largely went unrecorded, but also because it vividly dramatizes two extraordinary voices in conversation. There's Cudjo — haltingly retrieving his painful memories — and, there's Hurston, listening, nudging and, sometimes, making impassioned commentary on what she's hearing. Both Cudjo and Hurston often make their points poetically. For instance, in her introduction, Hurston points out what's missing in other books written about the slave trade, "All these words from the seller," [she says] "but not one word from the sold. The Kings and Captains whose words moved ships. But not one word from the cargo." In Barracoon, Hurston is determined to give the last living representative of that "black cargo" his say. The first thing Hurston seems to have learned about Cudjo was that in Africa his name was Kossula, which is what she calls him. The second thing she learned was that digression was an essential part of his story-telling style, which sometimes made her impatient. Kossula was no longer on the porch with me. He was squatting about that fire in Dahomey. His face was twitching in abysmal pain. It was a horror mask. ... He was thinking aloud and gazing into the dead faces in the smoke. His agony was so acute that he became inarticulate. He never noticed my preparation to leave him. In her moving foreword to Barracoon, Alice Walker says that Cudjo's stories of the atrocities African peoples inflicted on each other wounded Hurston. But, nevertheless, she kept returning to Cudjo's porch, asking him about the Middle Passage, his enslavement in Alabama, and the later struggles he and his wife faced as displaced free people, trying to eke out a living for their six children. By the time Hurston met Cudjo, his wife and all of his children had died. Once again, he was the last survivor and he was terribly lonely. He told Hurston: "When de earth eats, it doan give back." True enough. But in writing Barracoon, Hurston found a way to ensure that the earth didn't swallow Cudjo Lewis' precious words. This is FRESH AIR. Before Zora Neale Hurston wrote "Their Eyes Were Watching God" and the other books that would make her reputation, she was studying anthropology. In 1927, Hurston's deep interest in black history and culture let her into what became one of the most remarkable conversations of her life. The book that resulted from that conversation has just been published for the first time. Book critic Maureen Corrigan has the review of "Barracoon." MAUREEN CORRIGAN, BYLINE: (Reading) I want to know who you are and how you came to be a slave. That was one of the first questions that Zora Neale Hurston asked 86-year-old Cudjo Lewis when she traveled from New York to Mobile, Ala., to interview him in the summer of 1927. Back then, Hurston was studying anthropology at Columbia University and doing fieldwork, collecting black folklore and historical data. Cudjo Lewis was already known to those who cared about black history. He was the last known living person who could recount firsthand the experience of having been taken captive in Africa and transported on a slave ship to the United States. 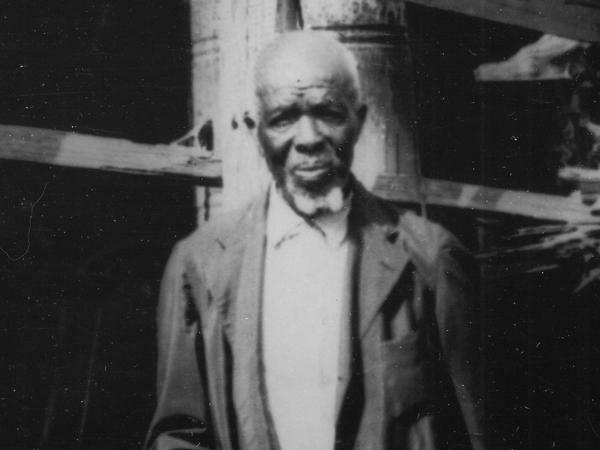 Cudjo spent years in slavery and, after the Civil War, helped found a settlement called Africatown near Mobile. That's where Hurston interviewed him over a three-month period, coaxing Cudjo into talking about the past with gifts of peaches, ham and watermelon. The short, book-length manuscript Hurston produced in 1931 was called "Barracoon," named after those structures, like holding pens or stockades, where captured Africans were confined before being loaded onto ships. Hurston's manuscript has a complicated backstory, but the gist is that the book generated little interest back then from publishers. Only Viking Press was willing to publish it with the stipulation that Hurston change Cudjo's voice, transforming his dialect speech into the King's English. Hurston refused, and "Barracoon" languished, known only to scholars until now. For skeptics who believe that all the archives have long been plundered and all the literary treasures of the past have already been published, "Barracoon" will be a conversion experience. It's a monumental work not merely because it describes aspects of the slave trade that largely went unrecorded, but also because it vividly dramatizes two extraordinary voices in conversation. There's Cudjo haltingly retrieving his painful memories, and there's Hurston listening, nudging and sometimes making impassioned commentary on what she's hearing. Both Cudjo and Hurston often make their points poetically. For instance, in her introduction, Hurston points out what's missing in other books written about the slave trade. (Reading) All these words from the seller, she says, but not one word from the sold - the kings and captains whose words moved ships, but not one word from the cargo. In "Barracoon," Hurston is determined to give the last living representative of that black cargo his say. The first thing Hurston seems to have learned about Cudjo was that in Africa, his name was Kossula, which is what she calls him. The second thing she learned was that digression was an essential part of his storytelling style, which sometimes made her impatient, but Hurston's frustration falls away when Cudjo starts telling her about the events leading to his capture in 1859. Cudjo was 19, and a neighboring tribe, led by female warriors, massacres most of his neighbors and family and takes him and other young people captive. The memories are bloody and grisly. Hurston ends her account of that conversation by commenting, (reading) Kossula was no longer on the porch with me. He was squatting about that fire in Dahomey. His face was twitching in abysmal pain. It was a horror mask. He was thinking aloud and gazing into the dead faces in the smoke. His agony was so acute that he became inarticulate. He never noticed my preparation to leave him. In her moving forward to "Barracoon," Alice Walker says that Cudjo's stories of the atrocities that African peoples inflicted on each other wounded Hurston, but nevertheless, she kept returning to Cudjo's porch, asking him about the middle passage, his enslavement in Alabama and the later struggles he and his wife faced as displaced free people, trying to eke out a living for their six children. By the time Hurston met Cudjo, his wife and all of his children had died. Once again, he was the last survivor, and he was terribly lonely. He told Hurston, (reading) when the earth eats, it don't give back. True enough. But in writing "Barracoon," Hurston found a way to ensure that the earth didn't swallow Cudjo Lewis' precious words. GROSS: Maureen Corrigan teaches literature at Georgetown University. She reviewed "Barracoon" by Zora Neale Hurston. Tomorrow on FRESH AIR, we'll discuss Environmental Protection Agency head Scott Pruitt, who is currently the subject of 11 investigations. My guest will be New York Times reporter Eric Lipton, who's read thousands of documents about Pruitt and the EPA released through the Freedom of Information Act. Lipton first covered Pruitt when he was Oklahoma attorney general and sued the EPA many times. I hope you'll join us. FRESH AIR's executive producer is Danny Miller. Our senior producer today is Sam Briger. Our interviews and reviews are produced and edited by Amy Salit, Phyllis Myers, Lauren Krenzel, Heidi Saman, Therese Madden, Mooj Zadie, Thea Chaloner and Seth Kelley. I'm Terry Gross.